September all but disappeared. I've been super busy at work and doing flowers as well as a jam-packed social schedule. It's been great! But I've missed you, dear blog, and am now a few days late in my September Illustrator post. Ah well. Lisa Connolly is an Irish-born illustrator who was educated in Wales at the West Wales School for the Arts. Initially, she studied fashion design but soon transferred into textiles and began working on designing textiles, learned to stitch in a method she calls "stitch-a-crazy-stitch", then print on fabrics and ceramics, and as a result has developed a unique illustrative style. 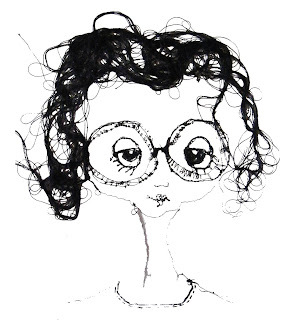 Lisa creates strange and unusual characters, often stitched into fabric, as above. I'm particularly interested in the characters she stitches and then prints on home goods, which can be found and purchased on her website. The home goods are unusual, and really anything but "cute" that seems to dominate the current look for illustrative pattern. I admire the expressive nature of these faces. Lisa has shown her work across London and Dublin. Currently her work is supported by the Laura Ashley Foundation. Check out some of her recent work on her blog found here. Her work was also featured on Design Milk in 2009.